Gordon Ramsay's The Savoy Grill, located within the famous Savoy hotel on the Strand, offers a truly opulent dining experience. It has hosted some of the world's most famous faces, making it the definition of 'gourmet glamour'. Balancing style with substance, the Art Deco interiors hark back to the roaring 20s. The fabulous menu features British favourites, such as Beef Wellington, with a French touch appearing in dishes such as Apple Tarte Tatin. Alongside the main dining room, guests also have the option to book the Kitchen Table, or the upstairs Private Dining Room which has views across the front of the Savoy. The quintessential Grill – the Savoy Grill, in the heart of London’s West End presents the classics – steaks, roasts and pies to their absolute perfection. With the privacy of the D’Oyly Carte room perfect for celebrations, the Savoy Grill has the most versatile dining options for any occasion. Enjoy a 2 course Sunday Roast lunch with a Bloody Mary or Mocktail for £49 per person. Enjoy 2 or 3 courses from the seasonal set lunch menu for £31/£35. Enjoy 2 courses for £31 or 3 courses for £35 before curtain call or after the show from the pre/post theatre set menu. 7 course tasting menu featuring some of the most iconic dishes of Savoy Grill. Disappointing experience. Family Easter lunch- we waited an hour for our main course and when it arrived, the meat was in the main overdone or not particularly anything special. Service was slightly sloppy. Would not dine here again - the whole affair was overpriced for the experience and service we received. Sono anni che a Pasqua frequentiamo il Savoy Grill. Posto ideale per una serata speciale a suon di cibo sopraffino. Sopra tutto Wellington Beef da leggenda. Loved the place - great restaurant in a lovely hotel. I did think the drinks were over priced though. I bought a voucher for my husband's birthday and we went along to the Savoy. First we went for some cocktails in the American bar which was great and we had a view of the Thames. Very pleasant helpful staff. I could not eat the biscuits or nuts that the waiter brought so he went and and got some crisps that I could eat which were tasty. We then went to the Grill where a waiter greeted us and I advised my dietary requirements and he was very helpful. Very nice restaurant. We chose our meal, nothing was too much fot our waiter, he was very helpful with our selection of starter, main and dessert. The meal was delicious from start to finish. My husband is a diabetic so was brought fresh fruit and a sorbet. Then when we ordered coffee the waiter came along with a cake and candle on a plate with Happy Birthday written in chocolate which was a surprise as I had not mentioned it was my husband's birthday. The waiter must have read what I had put on the voucher. A thoroughly enjoyable lunch. We shall certainly visit again. Absolutely fantastic. They made an extra effort for my partner's birthday and took the time to provide us with an unbelievable service. Couldn't recommend this enough! Deviated from the suggested medium rare steak, and the medium well done was very tough, however they were very decent and removed it from the bill, I can have no complaints, spatchcock chicken was amazing. We did the tasting menu with wine pairings. The food was excellent, but the portions were small and the food service was glacial. Fantastic restaurant and hotel. Great service by all staff and the food was lovely. He service ranged from poor to good through the meal as we were served by at least 4 different guys. Knowledge from the servers ranged similarly. Won’t rush to return. Dined at the Grill my last night in London! Steak T Bone was fair at best. Grizzle thru the middle couldn’t cut thru it. Spoke with waiter and bus boy. The waiter was quite apologetic but had to see his manager. Who responded you can have a free coffee. I did eat a good portion of the steak but certainly think a small reduction would have been fair. The waiter offered to take off his gratuity but that was not fAir. As he tried to please the best he could. Overall the worst meal I had in London. 2 main courses were luke warm. Side order of seasonal vegetables sent back as cold. Paying for location and Ramsay name rather than quality of food. Wouldn't rush back. It was a fabulous way to spend a Sunday lunch. Seamless service, great location, lovely food and that special Savoy ambience. What a treat. The Beef Wellington was exceptional, the wine suggestions imaginative and lovely and the service exceptional. What a lovely place to take my wife for her Birthday. 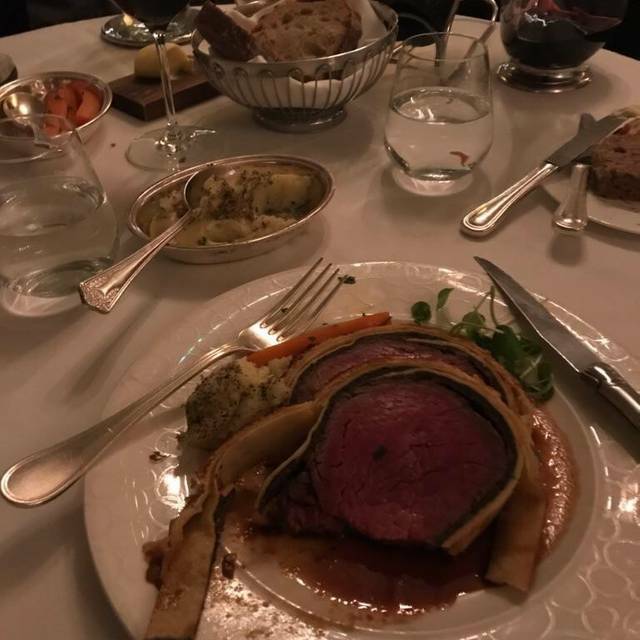 We have eaten in Casper’s Restaurant at the Savoy on previous occasions and found the food and atmosphere delightful and exceptional value for money, but unfortunately we did not feel the same on this occSion at the Savoy Grill. The food was really good and the drink Mojito too. We had a fun time. Went here for a lunch to celebrate Mother’s Day. It was a fantastic meal with attentive staff, set in a stunning venue. So overcooked the pastry was rock hard and meat dried up. Lobster Thermidor sauce tasted just like holandaise and roast beef was not very good ! Shame as we were going to book Xmas lunch when books open in August but re thinking now. Excellent food and service. Will most definitely be returning again. Wonderful as always - really delicious classic food, impeccable service, and a lovely old-world atmosphere. Pricey, but as an occasional treat, worth the cost. Food and service good would recommend to a friend. We had the pre-theatre menu which is good value but found money for side dishes was quite high. Terrible food terrible service ugly decorations. This place was disgusting and not worth the tasting. The service was slacking too. Was not the experience I was hoping for. As a Gordon Ramsay restaurant, I had a pretty high expectation based on the presentation and the taste of the meal, but it served as so simple as it has done at home. Also, the food doesn't match with their Instagram at all. I expected baked Alaska will fire up as a way of serving in front of us but, its shape was totally different and it served as cooked. it doesn't worth paying high prices for regular, simple dinner. We leave the restaurant disappointed. Excellent service and fabulous food! Their Beef Wellington was amazing! Everything you would want - perfect service, food and ambiance. Delicious, great wine selection, and the food was spot on. Great service from our waiter! Food taste was excellent but could of been a little warmer. Service couldn’t fault and ambiance was great. Little pricy. Would def return. Poor atmosphere in the restaurant not what you would expect for a 5 star hotel. Service from staff was cold and rushed. We waited to long for some bread to arrive then 1 minute later our food arrived. Not how things should be done. With so much choice in London this really is not worth a visit. An amazing experience, food was delicious and service as expected in a hotel of this rating. Was expensive but well worth it as a special occasion. The savoy grill is a five star experience with the exception of a problem we had with one of my guests steaks. Ordered as medium rare, it came up incinerated. It was sent back and a full 15 minutes later another came - again incinerated. The manager came and apologised and offered us complimentary Brandies. My guest’s meal experience was ruined - he had no main course in the end. A pity as the place looks a million dollars. Obviously expensive as expected. We had the Taster Menu. But the art deco surroundings were worth it. The only downside was that we were rather cramped in a semi-circular seat with half the table being unused. They don't seem to like catering for parties of three.